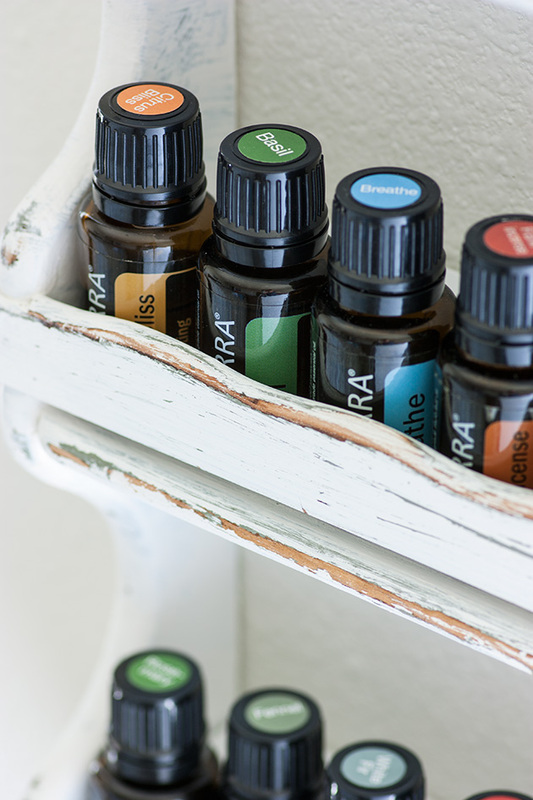 As my collection of essential oils grew, it quickly became clear that I needed a dedicated essential oils storage spot in the house—one that was accessible, attractive and affordable. When I ventured into the world of therapeutic grade essential oils I had planned on buying a bottle or two, tops. As it turns out I gott a little carried away and have built up a sizeable collection. As my collection of essential oils grew, it quickly became clear that I needed a dedicated essential oils storage spot in the house—and so I began searching for a storage solution that was accessible, attractive and affordable. 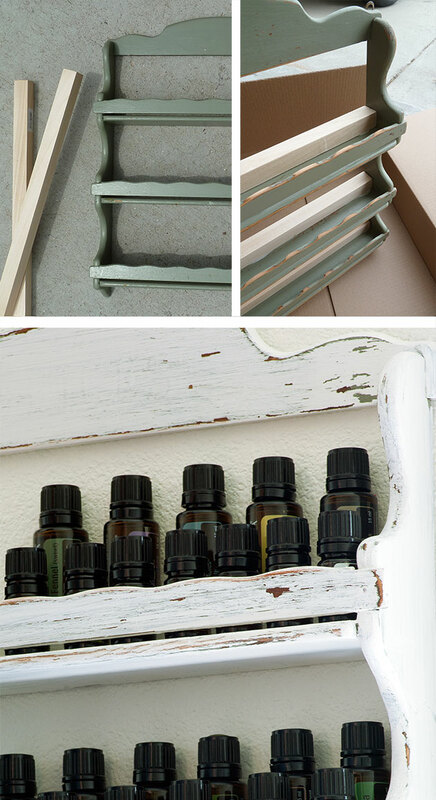 This DIY essential oils rack fit the bill. An added bonus of this rack is that though the original spice rack only had three shelves, pieces of square dowel added three more—like stadium seating for your growing oil collection! Find an old school style wood spice rack like the one pictured below—I got mine at Goodwill for $1. Head to Home Depot and buy a 1×1-inch square wood dowel(s) (is a dowel a dowel if it’s square? Not sure what to call it)—enough length to fit the width of each shelf. Tip: Home Depot will gladly cut wood to the length for you. So if you don’t have a saw, give them the exact measurements and have them do the cutting. Give the spice rack a good sanding with fine sand paper. Give the dowels a gentle sanding. Grab the bottle of liquid nails and apply just enough to cover bottoms of cut dowels and adhere flush to the back of the spice rack shelves. Let dry. When paint is almost dry, take your sand paper and scuff up the paint a bit for a distressed effect. 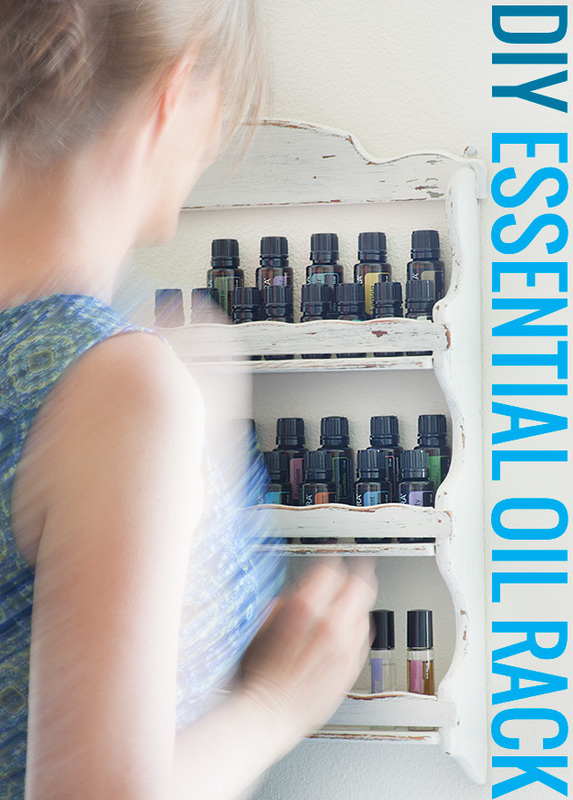 This rack fits most standard-size essential oil bottles. Before selecting your dowel size, however, I suggest measuring your spice rack shelf and then choosing a dowel width that would leave enough room for the width of the bottles. If you are interested in exploring the world of essential oils or would like to order or sell Certified Pure Therapeutic Grade oils, drop me a line via the Contact page or visit my store. Awesome, Lexie! I've been wanting to do something like this, and now I know how! 🙂 Thanks! This is a neat idea, but wher do you keep the rack, since the oils should be kept in a dark area? This is so awesome! I would love to learn more about how essential oils can help. I am particularly interested in mood disorders. Lexie, this is a really cute and inventive idea. I love the fact that you took an old rack and refurbished it. What a great inexpensive idea. Plus you get to put to use something that might otherwise get thrown away! Essential oils are such a wonderful thing! I would love to have a huge collection of them. This is a great way to do that and not take up too much space. Maybe I need to make two of these, one for each side of the fridge. I can use one as an actual spice rack and the other one for the essential oils. Thanks for the response Lexie! I don't go thru mine very quickly at this point, so they are in an opage container in my bathroom. I had looked for a neat way to store/display them a couple of years ago, but came up empty. Love this idea! Like someone else mentioned, it could be hung inside a closet door. You are amazing lady! I got into essential oils years ago when I experimented with making my own bath products. I've dropped it since, but you've renewed my interest! I'd never thought of using them in cooking, too. Do you think of them as extracts, essentially? Actually, as the oils are in Amber colored bottles, they don't have to be kept in a dark area. At all. Now I wouldn't have them in DIRECT SUNLIGHT 24/7/365, but they'll be just fine on a wall wherever you decide to put them. And I LOVE THIS IDEA!!! We use our doTerra oils constantly – and this is a great way to have them in each bathroom – kids' bathroom too! This is wonderful! Doing it! Oh I wish you lived closer! Oh what fun we’d have! The invitation is still open!! !